As menacing as ED-209 was on the silver screen in RoboCop, he’s just as menacing in real life even though he’s been put together with cardboard, aluminum, springs, velcro and bungee cord. Calling ED-209 the coolest movie robot of all time, twin brothers David and James Codeglia used LightWave 3D software to bring the formidable Enforcement Droid Series 209 (ED-209) to life. 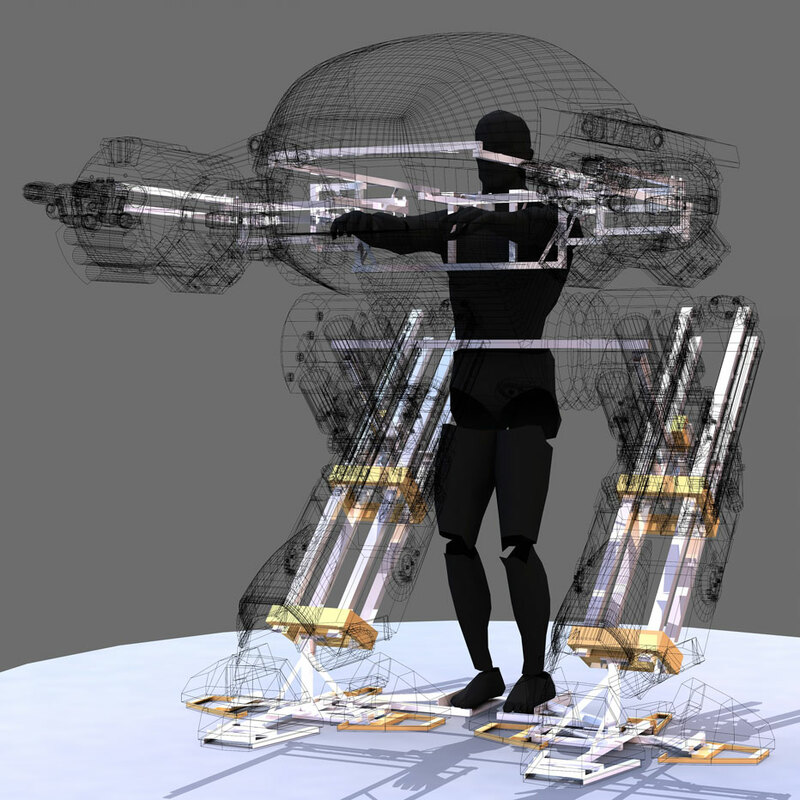 LightWave’s 3D Modeler enabled them to visualize how to design ED-209 as a full-size walking costume, and use that 3D blueprint to fashion him out of common materials available in the real world. This labor of love was part of Our RoboCop Remake (2013), a clever, comedic parody—produced by David Seger—where each filmmaker involved remakes a different scene of Director Paul Verhoven’s 1987 classic movie RoboCop. The scenes are then edited together to create a full-length movie for a special screening where the casts and crews involved get to laugh at each other’s work. The finished movie is essentially a patchwork quilt of wildly different scenes that work together to dramatize the storyline of the classic movie. But, for the viewer, switching between all the creative approaches, styles and media—such as cartoons, puppetry, interpretive dance, and iPhone movies—can be jarring. While the filmmakers put their own unique interpretation on the scenes, continuity was maintained because they all followed strict rules—for example, keeping each main character’s costumes, hair color or accessories the same—so that viewers could easily identify which characters were which from scene to scene. Other rules dictated scene transitions and plot lines that had to be included, all of which helped with editing this voluntary creative endeavor together. The finished movie premiered at the Downtown Independent Theater in Los Angeles in 2013 to an audience comprised of the cast and crew from all the scenes and die-hard fans of this cult movie. This premiere was followed by screenings in select theaters across the U.S. The cast and crew for Scene 9 in Our Robot Remake, having a fun time on set. The Codeglia brothers—who co-own their Los Angeles-based production company Ghostlight—couldn’t wait to sink their teeth into their part of the movie. 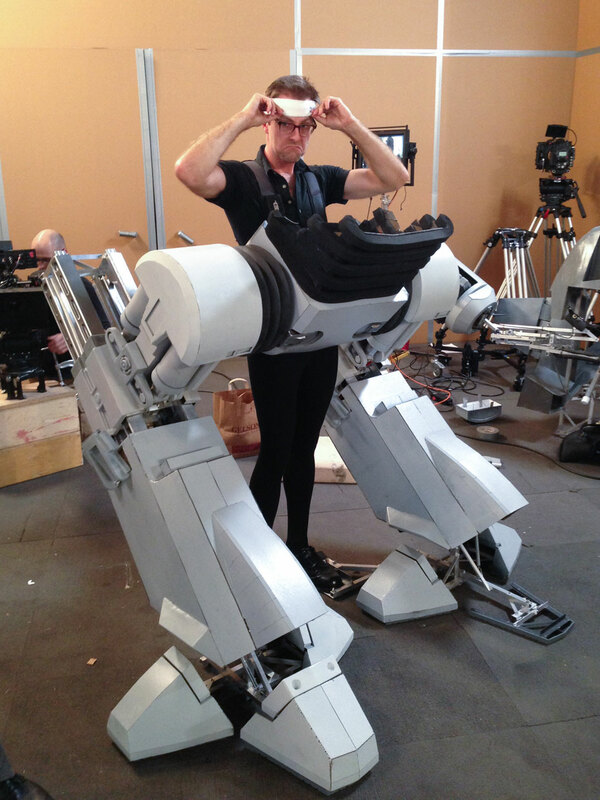 In fact, they began experimenting with ED-209’s design even before they were officially awarded their requested scene. They chose the scene where ED-209 makes a dramatic first entrance into the boardroom where OCP (Omni Consumer Products) execs are meeting. After the Detroit Police Department has been privatized and awarded to OCP, this malevolent corporation intends to use robotic cops to rid the streets of crime to pave the way for their planned utopian city. 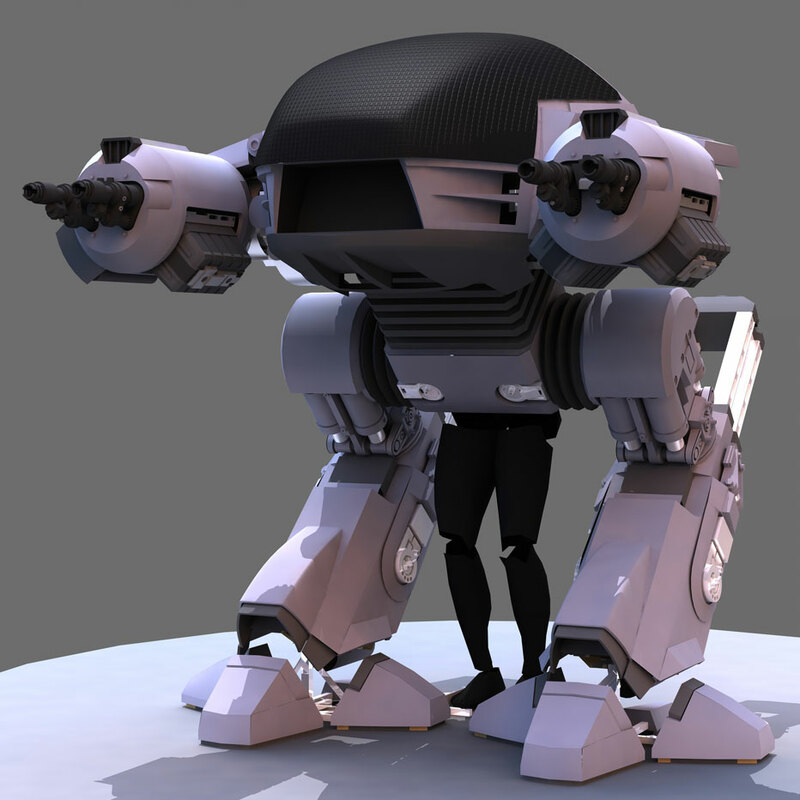 the ED-209 robot prop design in LightWave showing the skin and skeleton. The ED-209 skeleton created in LightWave. The ED-209 model skinned in LightWave. In this scene, an OCP executive unveils the powers of ED-209 by conducting a demonstration that goes haywire, leading to the malfunctioning ED-209’s killing of a junior executive, Kinney. However, in the Codeglia version, poor Kinney is played by a cute two-foot puppet that’s subjected to a never-ending barrage of gunfire. In their scene, there are actually several puppets—which were purchased online—that perform alongside human actors on the cardboard conference room set, which was designed in LightWave. The actors and puppeteers, who worked so hard to bring the scene to life, were all volunteers. “We wanted to keep the focus on ED-209. The more we worked on him, the more accurate and realistic we wanted him to be,” said David Codeglia, a director, visual effects artist and editor who directed this scene (known as scene 9) of the Our RoboCop Remake. His twin brother James served as director of photography. 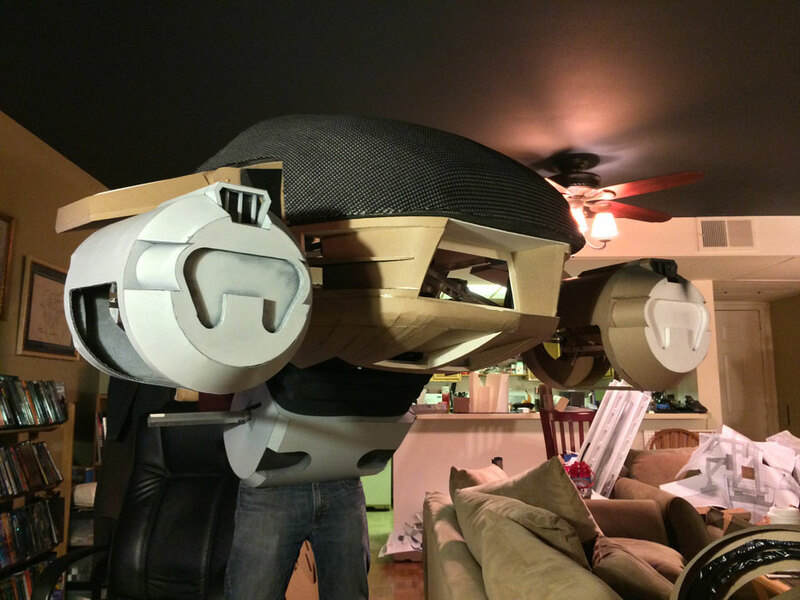 Together, they spent four months building ED-209 in their living room using LightWave as a means of streamlining the construction process and minimizing costly trial and error. The running joke of ED-209 is that he appears to be this menacing armored killing machine but in reality he’s too big to fit through doors and too clunky to take the stairs or chase criminals. In this scene, he doesn’t even recognize that the prospective criminal has surrendered and thrown down his weapon. 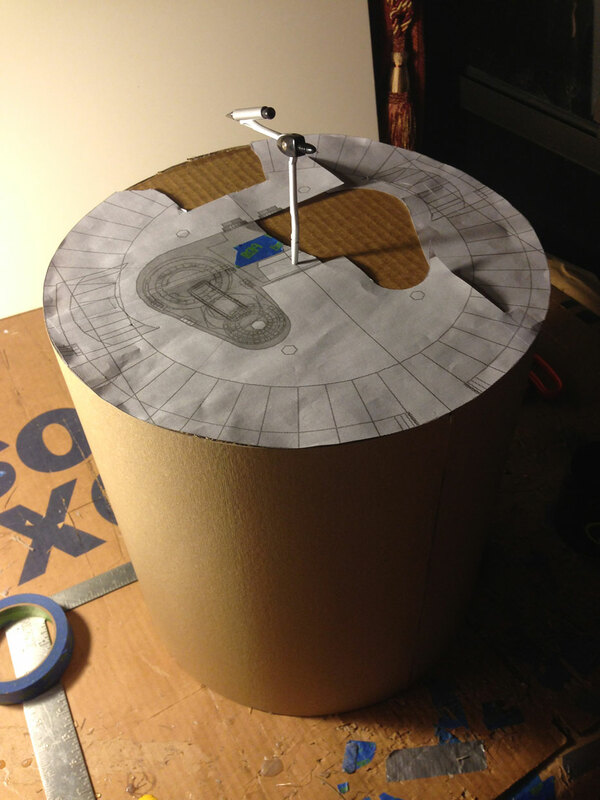 The gun blueprint for ED-209 - made with cardboard. 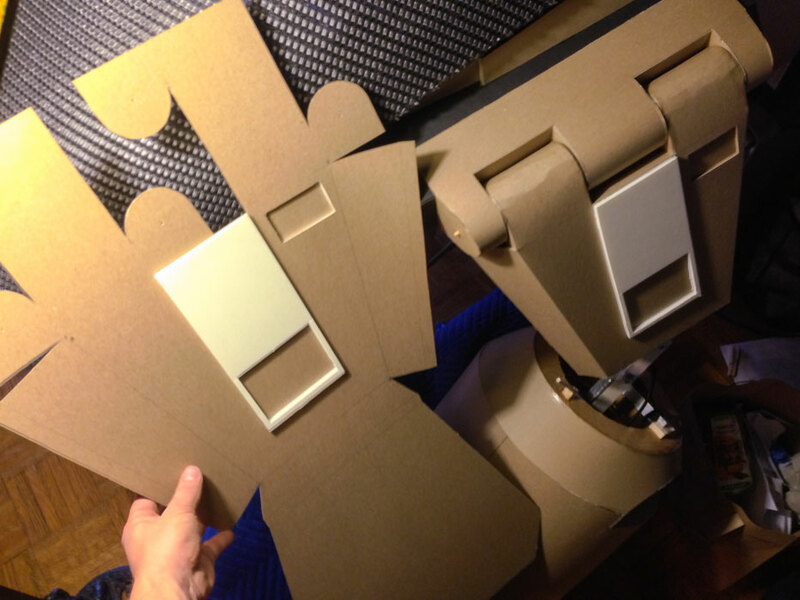 Constructing ED-209's gun arms made of cardboard, created from the pattern made in LightWave. ED-209's hip materials are put into place. 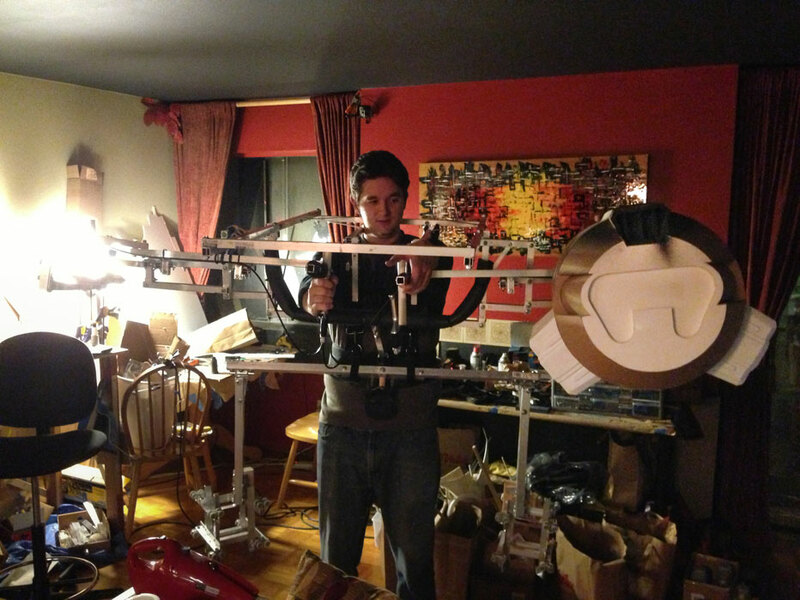 The skeleton gun comes together for ED-209. “LightWave helped us figure out how this skeleton and skin would all fit together,” said David Codeglia. “We built ED-209 in LightWave in 3D—to real world scale–using reference videos and photos I found online,” David Codeglia said. These reference materials included behind-the-scenes pictures of Phil Tippett and his team designing the original ED-209 stop-motion robot used in the 1987 movie. “After the design was finished, I unwrapped the LightWave geometry and laid it flat and printed the images onto 8.5 x 11 inch paper. The parts were then traced onto cardboard or art board, cut out, folded back together, glued and painted,” David Codeglia said. ED-209’s head mesh, also designed in LightWave, was cut from strips of clear acrylic wrapped in a metallic-looking fabric. He compared the process to Papakura, an art form that allows people to download patterns and blueprints for miniatures and models. In fact, there was an ED-209 Papakura model they could have worked with, but they passed it up because it wasn’t as accurate a depiction as they wanted. David Codeglia was able to use LightWave to experiment with the ED-209 CG model, and modify its virtual components, until he was satisfied that they would move the way he needed them to in the real world. 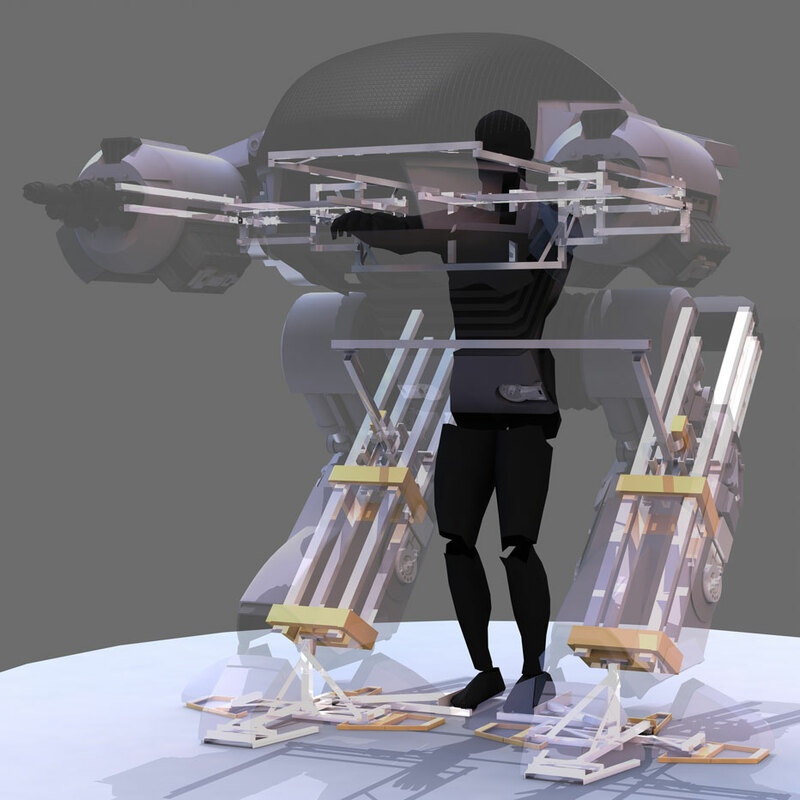 One complex aspect of ED-209 is the backwards sliding knee, which they constructed using four sliding closet door hardware assemblies, including the rails and wheels. Another complex, underlying mechanism needed for ED-209 were his elbows and gun-arms, which needed to pivot up and down, supporting 10-inch gun barrels while staying level to the ground. 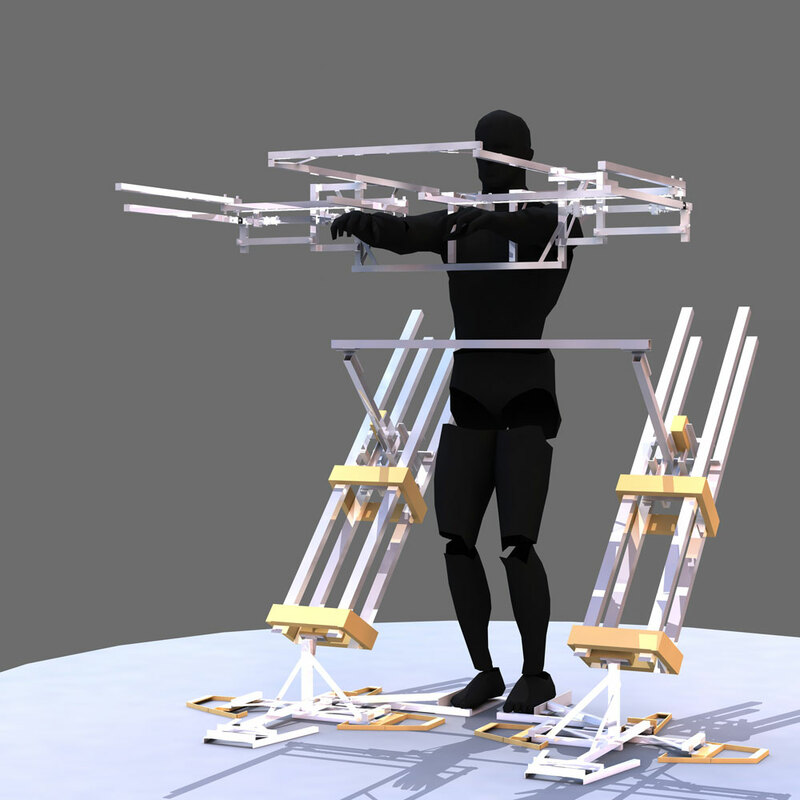 James had done a prototype of this gun-arm mechanism using popsicle-sticks and paper clips to achieve the effect of carriages staying level to the ground using parallelograms. 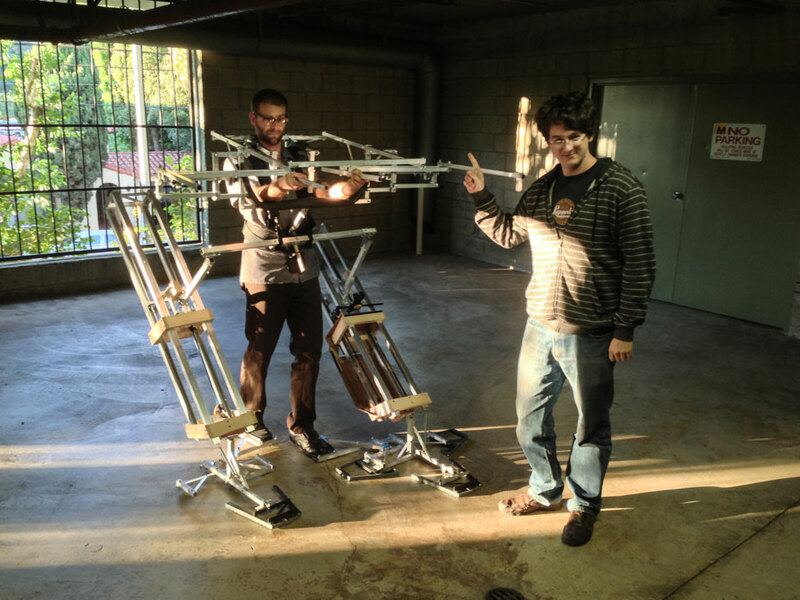 ED-209's real-world skeleton comes together. 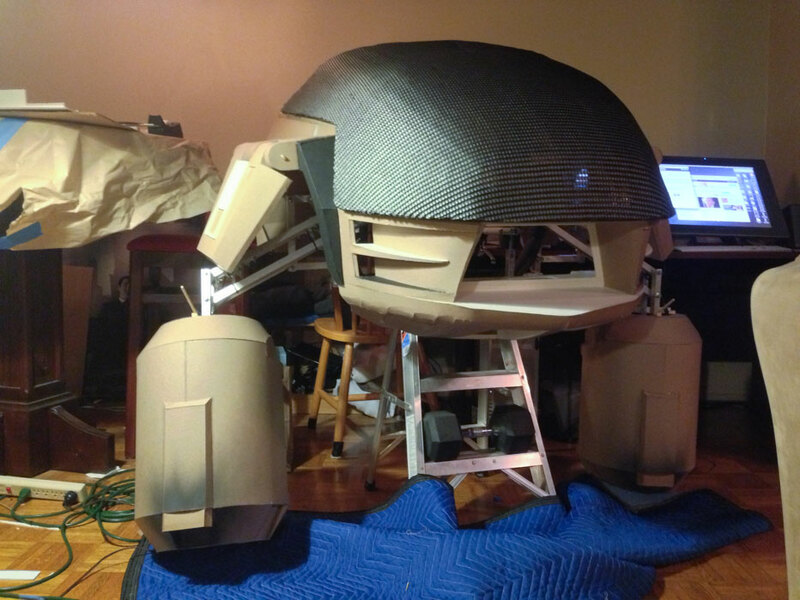 ED-209 starts to resemble a robot. 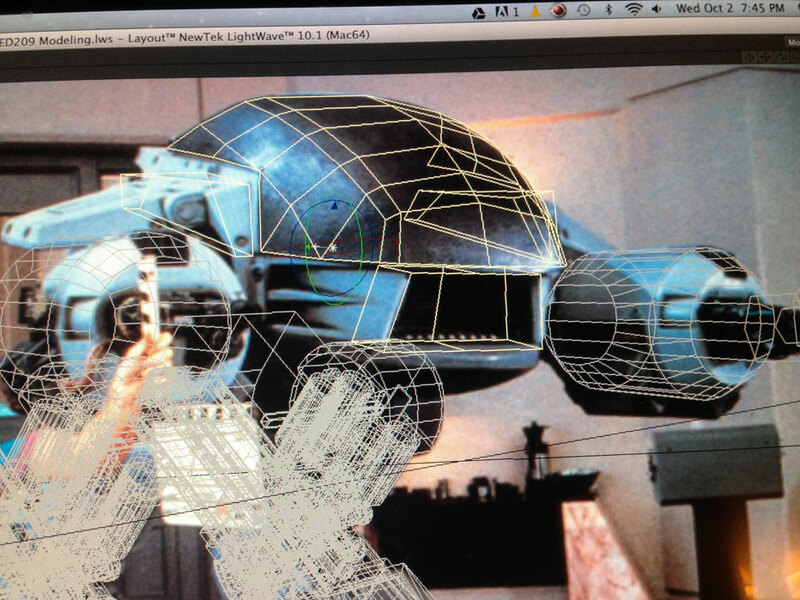 The LightWave wireframe overlaid on an actual photo of the ED-209 robot prop. The finished costume had an internal harness that Actor Daniel Allen Kent wore to help hold it up and move it. For comedic effect, Dan’s legs (wearing black tights and shoes) could be seen underneath ED-209 and a joke was written into the script that you could see his legs. “As a visual effects artist, I was tempted to fix some imperfections in post, like to paint out Dan’s legs, but resisted the urge to make it perfect. Another imperfection that was left in was the sight of Dan’s face peering out through ED-209’s mouth. The only CG enhancement I did in post was to add muzzle flashes to the scene using After Effects,” David Codeglia said. Dan wears a harness attached to ED’s pelvis and shoes attached to ED’s toes. When Dan walks, ED’s feet follow. 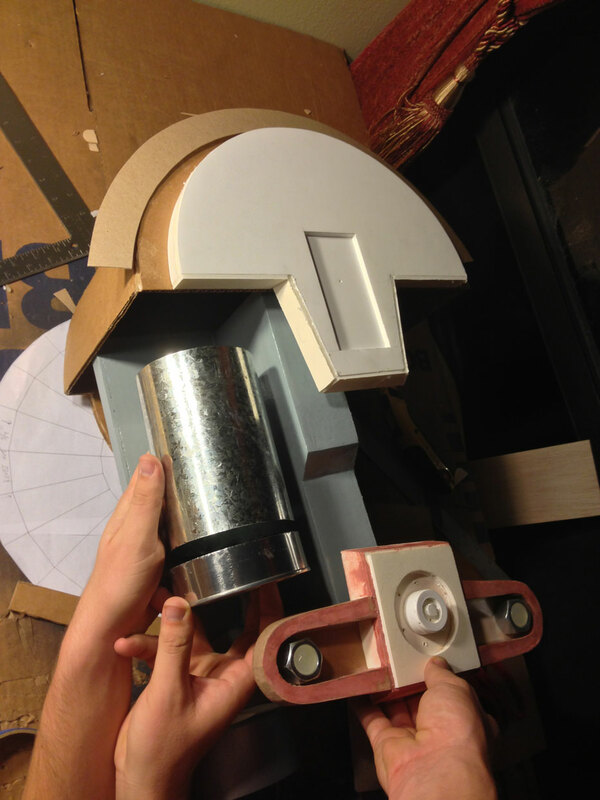 The foot hinges and sliding door rails are forced to move ED’s legs like the original film’s stop motion puppet. LightWave artists know this principal as Inverse Kinematics, where you animate a character’s extremities, and the skeleton between these points moves automatically. Most of the construction time was spent building the skeleton and making it humanly possible to walk in. When all of the pieces were assembled and decorations applied, the ED-209 costume was still a bit cumbersome and uncomfortable for the actor to wear beyond one or two takes at a time. 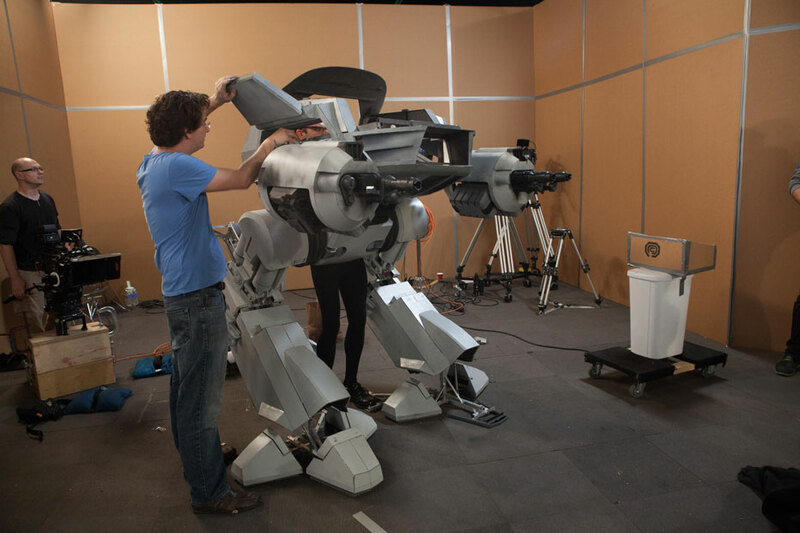 During the movie’s premiere week, the brothers disassembled ED-209, moved the parts to the theater, and re-assembled him in the lobby supported by a C-stand. Having ED-209 standing there in the lobby added excitement to the premiere, especially for fans that wanted to have their pictures taken standing next to him. 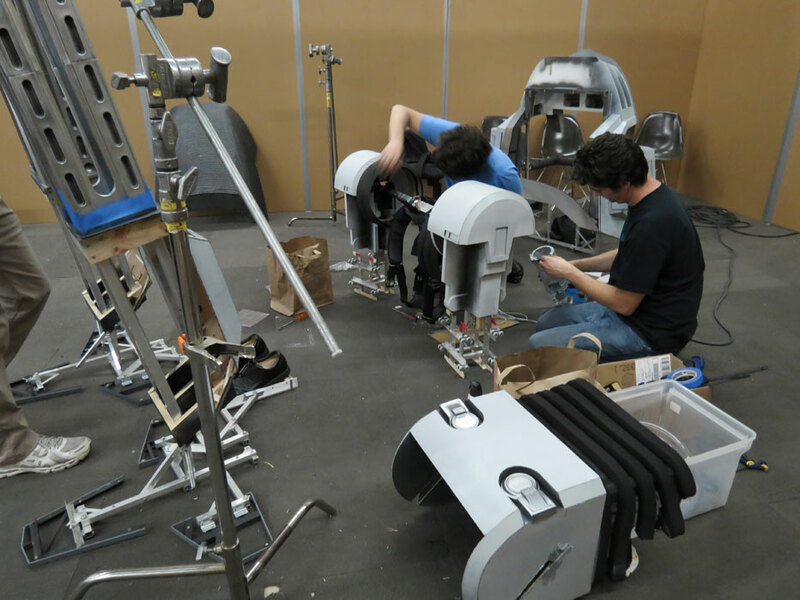 Assembling ED-209 for the shoot. Actor Dan Kent suits up for the shoot. Assembly nears completion for the shoot. 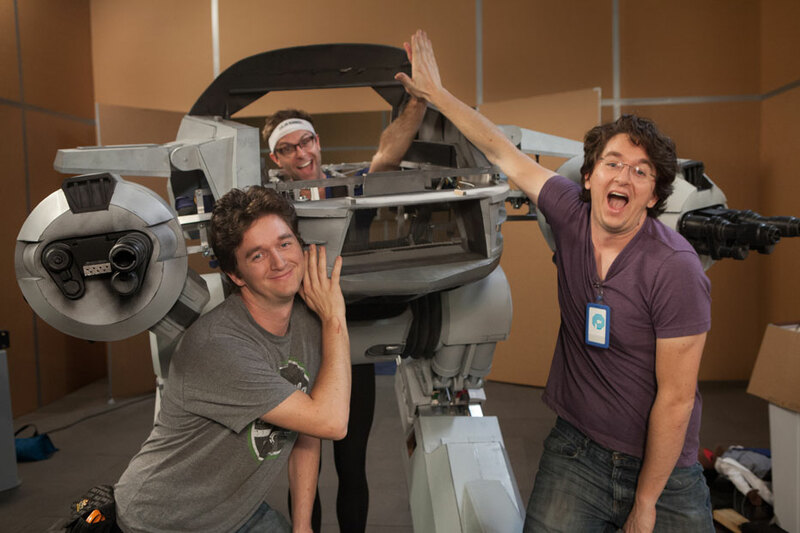 Dan Kent (in the ED-209 suit) and James and David Codeglia call it a wrap.